I love everything second hand! I shop for things that I could find in the stores (like clear glass canisters, or quality wooden toys from the new Hearth and Home collection at Target just waiting for some little visitors to play with) but I know this way I'll be saving a ton. I shop for things to add to my collection like globes (so many globes), vintage quilts, or milk bottles. I shop for things that you just can't find in any store, one-of-a-kind, never-seen-before things (like this vintage sheet that looks like it has cross-stitching on it or the rainbow and red plaid vintage xylophone). For me, it's a combination of things that make rummage sale time the best time of the year. I like the thought that I'm saving something from the landfill that I can still get some use out of, and I love having something that's a conversation piece and something I can connect with someone else over. Also, to be honest, it's the thrill of the hunt. I got lost on my way to an estate sale today, and came across the garage sale of the century. They were charging so little for some very good things. I can't wait to incorporate them into my home! It was a gift given to me from my husband. I had just junked my first one because it was so bad. I was feeling kinda bummed about it too as I love trailering the horses to the Crow Hassan park to ride. Without my knowledge, he got on Craig’s List, found a trailer, showed it to me, told me to get in the car and off we went to look at it. It was exactly what I needed… It was the action that was the biggest part of the gift and not the gift itself, if that makes sense. All from a guy who is allergic to horses but sees the joy they bring to my heart. Our Kentucky Goodwills tend to have clothing on the rattier side of secondhand, so instead, I shopped there for books. It’s amazing the classics people give away. On one occasion, I had a stack balanced between my hands and chin like the cheese-greedy mouse, Gus Gus, on Cinderella, and more than one shopper ogled at me as I teetered over to the purchase counter. I guess I could have gotten a cart. The book I remember best from that particular haul was St Augustine’s Confessions. I had never read it before, but something about the tiny ripped Penguin edition caught my eye. Perhaps because I’ve always had a Baptist’s untrained affection for stained glass, of which there was a vibrant print with a halo-wearing Augustine on the cover. Looks aside, I read that book slowly, meditatively, through the Advent season of 2014 and loved it: his thoughts on God, his anticipation of healing in Christ’s coming reign, words of such comfort during a doubtful time in my graduate school years. I took the book with me everywhere and wore more softness and holes into the binding than was there before me. I could not be parted with it, and it was one of the few books I slipped into my bags to Thailand. At the end of the two years I lived and worked in that country, I had acquired too many odds and ends from my travels to fit even that small paperback. I left it with a dear friend in the hopes she would find as much joy in it as I had. Eventually, my parents gave me a new copy for Christmas, and I’ve slowly been reading Augustine’s story again. Yet part of me still misses my tiny Penguin copy. While I agree that well-crafted words should resonate in the soul regardless of format, there’s a trick, a visual cue of a kind, in yellowed pages, crackly binding, text grayed from years of exposure to air, light, and thought, to awaken you to the agelessness of their wisdom. Yet books should touch many hands. One day, I will leave my own newer copy behind, not so new but battered and beautiful, for another doubter in need of an ancient light. And I pray they find it. My neighbor held a clothing swap and I found a tall pair of boots. Would they fit the bill for a Minnesota winter? I brought them home. My sister found my last pair of boots. Eight Minnesota winters later, they were worn paper thin but I had not thrown them away. Now I can. I have bona-fide replacements. I tested the new-to-me black and white boots made in Canada on a mile-long hike to a neighborhood coffee house. After weeks of brutal cold winter, the mid-30’s thaw was irresistible. The snow melt landscape looked treacherous, however. Those Canadian castoffs conquered the icy Minneapolis sidewalks. Friends and family noticed the new boots. I described how I found them. Then I lifted a foot so they could examine the underside. 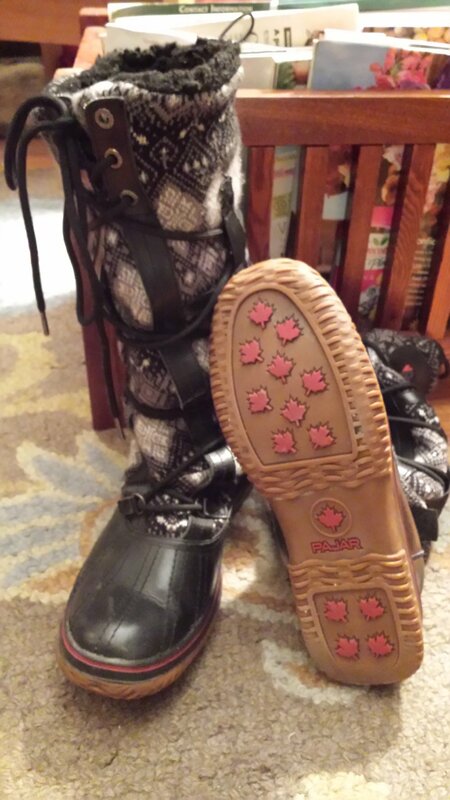 A maple leaf is replicated over the soles of the boots. I love crunching through snow and look back over my tracks for those perfect maple leaf tread marks. It’s my new way to embrace winter. *Tune in next week for more secondhand stories from my readers!